We offer highly effective ABC Powder Type Fire Extinguisher, a store pressure type fire extinguishers, which are suitable for A, B & C class, general paper and wood and cloth fires. ABC Powder Type Fire Extinguisher that we offer is ideal for preventing inflammable liquids like kerosene, paints, petrol and many more fuels. Moreover, ABC Powder Type Fire Extinguisher that we provide is easy to install and handle with the portability feature of this device. 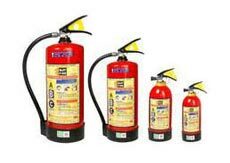 With all available sizes, ABC Powder Type Fire Extinguisher can fight any type of intense fires.